Nowadays, studying Abroad in Italy is very easy. Though you are not rich, you can apply to the university by taking student loans at universities in Italy. And you will also eligible to get scholarships and other financial aid programs offered by the universities, However, these are available on submission of necessary documents only. Although it is easy to get admission in the Italy, you need to concentrate on the application process and Checklist for Italy. For some universities, you can apply through online, but for some other universities, the application form can be downloaded from the website. While applying to the universities either in Online or offline mainly you need to concentrate on the documents you required send along with the application. Only after processing the documents only the Universities will issue offer letter. To apply for any of the universities in Italy, you need to send the following documents to university’s graduate admission office. But the requirements may change from university to university. Here we have provided the complete checklist for Italy to be sent while applying to the Undergraduate and postgraduate courses in any University in the Italy. 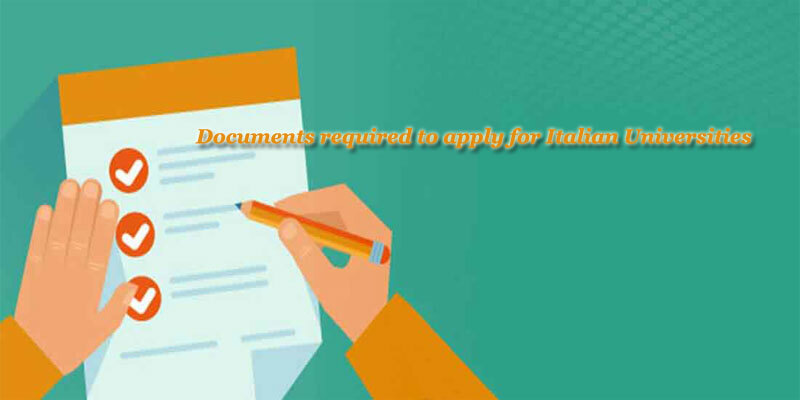 By checking the below provided Checklist for Italy, organize all your documents before applying for admission in any University in the Italy. Copies of all Educational Documents (10th, 12th, Bachelor’s, etc). IELTS score card / MOI. Letter of Recommendation (minimum 2 LOR’s). Passport Size Photographs (3×4 cm photographs with white background). Additional Documents (Extra Cirricular Activities). The Application form is the entry which you need to fill carefully to get admission in your selected university. You can fill the application forms through online or offline depends on the availability of application forms. Some universities offer online application process, while some other universities offer paper application form at the university’s website. For any admission in Italian Universities, you need to take the English language to tests to prove your efficiency in English. With these Test Scores, the Universities assess the candidate ability and skills to successfully complete the course. For any Course like Master’s or Business Program, you can take some popular English Language Tests like IELTS. 10th Grade Transcripts & Certificate. 12th Grade Transcripts & Certificate. Bachelor’s Transcripts & Degree (for Masters/PG Programs Only). Master’s Transcripts & Degree (if available). Diploma Transcripts & Certificate (if available). The Statement of Purposes is a brief and focused essay on one’s career and research goals and accomplishments so far to achieve them. Through SOP you need to tell them why you have chosen this course, why you opted for that particular university, what are you planning to do after the course, interests and other personal Details? A well established SOP will be the key to your way into the university. So take a good amount of time before you submit the SOP. A Recommendation letter is a letter requested to be written about us by someone. As People always want to know what others think about you, to assess the qualities, Characteristics, and capabilities of the person to perform a particular task the universities ask Letter of Recommendation form. Find the right person who you know for sure to ask for a recommendation letter to nail an admission. A sad recommendation letter will push you down the ladder. Employment Certificates from all Previous Employers. Along with all above documents, you need to send your Resume that includes the individual details like their educational background and skillsets. it is always a good idea to prepare a powerful resume. It is wise to get help while preparing your resume to prepare the most powerful one. Though it looks easy to get, but you need to concentrate on these photos. You need to arrange correct sized and latest photographs to apply. If you have not attached the correct sized photographs your application may get rejected. If you have any additional documents like Paper presentations, Your organizing skills in your symposiums, etc. you can also submit them along with the documents mentioned in the Checklist for Italy. It will be the smallest award to push your application a little harder. So send your certificates that will explain your talents and extracurricular activities you’ve undertaken. After receiving your application the university will verify the student documents or profile and will send you the offer letter. If the Student does not meet any requirement of university or Genuinity of a student is doubted they will reject the application. Once you have received the offer letter you can apply for the Student Visa by submitting required Documents.